THE MINISTER FOR Finance has weighed in on the row over the set-up costs of Irish Water. Speaking in Brussels this morning, Michael Noonan responded to the comments of ESRI economist John Fitzgerald, who said that €2 billion had been wasted on overstaffing at the water body. 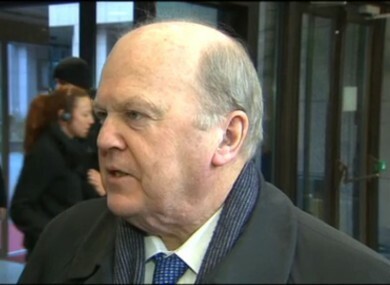 Noonan said that Fitzgerald had also pointed to savings. “John Fitzgerald also said that there will be a saving of around €2 billion that will be manifest by 2020. “In some mythical country, where there was no water service and you came in to set up a water service, you’d do it with a lot less people. But the extra manpower comes from the fact that 34 different local authorities are now running the water service. Noonan went on to say that there are 1,000 staff currently employed in Irish Water who are installing water meters. He said that when that process is done, those staff will no longer be required, adding to the savings that will be made at Irish Water. Email “'In a mythical country, you'd have set up a water body with less people' - Noonan”. Feedback on “'In a mythical country, you'd have set up a water body with less people' - Noonan”.